On July 4th 2008, the performance group The Yes Men distributed a fake edition of the New York Times on the streets of New York City. The paper is dated one year ahead. The news are the wishes and dreams of many and show what might be possible. 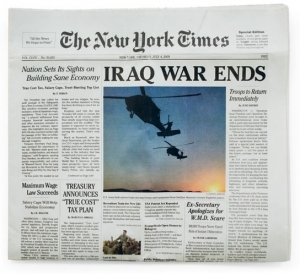 Headlines like »Iraq war ends« or »National Health Insurance Act Passes« surprise and amaze the readers, they look up confused – and the film THE YES MEN FIX THE WORLD documents this beautifully. Igor Vamos (alias Mike Bonanno) born in 1968 and Jacques Servin (alias Andy Bichlbaum) born in 1963. Both live in New York City, USA.